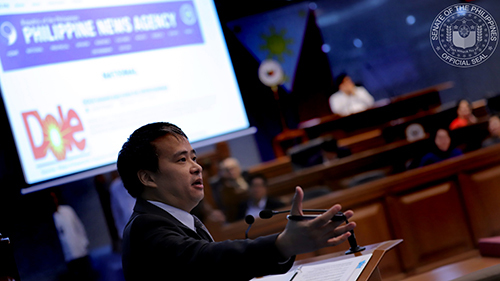 Senator Joel Villanueva on Wednesday urged the President to sign the Tulong Trabaho bill that seeks to provide free access to technical-vocational education amid recent report revealing that educated Filipinos comprise almost half of the unemployed population in the country. Based on the JobsFit 2022 Labor Market Information (LMI) Report of the Department of Labor and Employment (DOLE), 43.9 percent or almost a million of the unemployed across the country in 2017 have either reached or graduated from high school. Of the said figure, 825,000 are college undergraduates or those who have already completed a college degree. “This is a serious concern since it highlights the prevalence of job-skills mismatch in our country. To help resolve unemployment, the knowledge and skills of our graduates must match with the jobs needed by the market,” Villanueva, chairman of the Committee on Labor, Employment and Human Resources Development, said. The report also noted that college undergraduates or graduates are less likely to get hired compared with jobseekers with lower level of educational attainment due to former’s “higher reservation wages” and patience to wait for better job offers. The DOLE added that the chance of finding employment may also depend on the program or course the college graduates have completed. “Job-skills mismatch remains a problem in our labor sector and that is why we are adamant in pushing for the passage of our Tulong Trabaho that seeks to narrow the gap of unemployment by providing free tech-voc training and addresses job-skills mismatch through establishment of a Philippine Labor Force Competencies Competitiveness Program that is based on Labor Market Intelligence Reports,” Villanueva, the measure’s principal author and sponsor, said. The law increases the funding for technical and vocational trainings by providing for a Tulong-Trabaho Fund that will grant qualified recipients access to TVET training programs through the full payment of the selected programs’ training fees. The fund also grants additional financial assistance to students such as transportation allowance and laboratory fees. The Tulong Trabaho fund will be administered by the Technical Education and Skills Development Authority (TESDA). “We would like to underscore that tech-voc has proven to be a viable option especially for those who want immediate employment. In fact, 7 out of 10 tech-voc graduates easily find decent jobs due to the high demand of skilled workers here and abroad,” the senator further emphasized. Meanwhile, the senator emphasized the importance of the Philippine Qualifications Framework (PQF) law or Republic Act 10968 which Villanueva also authored and sponsored that institutionalizes a national qualifications framework that can prepare Filipino workers for the global marketplace. “We thank the President for supporting the PQF law which complements our Tulong Trabaho bill since this will ensure quality in our education and training systems, make qualifications earned here in the country recognizable in other countries and enable employers to respect and value these qualifications. We are hopeful that the President will give the same amount of support to our Tulong Trabaho Act,” Villanueva said. “The passage of our Tulong Trabaho bill into law will make tech-voc accessible to all, boost our workers’ confidence to face the world of work and ensure that the youth who are ready to work hard with the right skill sets to obtain in-demand jobs.” the senator added. The Tulong Trabaho Act now awaits the signature of the President following the ratification of both Houses of its bicameral committee conference report.